Chelsea sign Juan Cuadrado: Chelsea have seal d the deal finally of Juan Cuadrado from Serie A side Fiorentina for a fee around £27million. Chelsea have sealed the deal finally of Juan Cuadrado from Serie A side Fiorentina for a fee around £27million. Chelsea has made a record in the Premier League of paying the biggest amount in the winter transfer window. The Colombian have reportedly signed a four and half year deal with the London side after passing his medical test earlier today. Mohamed Salah was included as part of Cuadrado’s deal. He joins on loan for the rest of the season with an option to seal a permanent Serie A move. Chelsea did not splash a big amount from their account on Cuadrado’s move as they sold André Schürrle to German side Wolfsburg for a fee around £24million. The World Cup winner has agreed a four-and-a-half-year with a wage around £85,000-a-week. The Blues are expected to reveal their new signing Cuadrado in the next few hours. The Colombian has just thanked Fiorentina’s fans for their love and support during his wonderful years in Florence. The 26-year-old has moved to a new club but his former side where he played two and a half season remains in his heart. 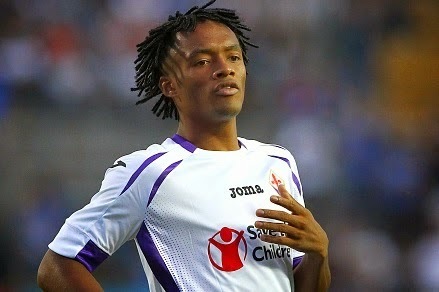 Cuadrado netted 26 goals in 106 appearances for Fiorentina in all competitions.